When we start our OSGi bundle the start(...) method will be executed. And when we stop our OSGi bundle the stop(...) method will be executed. That's all. No other fancy stuff. Probably you are wondering about the package org.osgi.framework - we'll talk more about it later. I'm not going to explain what these headers do. It's quite obvious and you can check the meaning of all OSGi headers here. The most important thing here is the Bundle-Activator header which points to our class which we haven't compiled yet. Another interesting thing to know is that the bundle's uniqueness in the OSGi environment is based on the combination of Bundle-SymbolicName and Bundle-Version. Our bundle has no dependencies on other bundles, apart from the default org.osgi.framework package which has been declared in the manifest headers. Now it's time to compile the Activator class. jar -cvmf .\src\META-INF\MANIFEST.MF .\osgi-sample-felix.jar -C .\bin\ . jar -cvmf .\src\META-INF\MANIFEST.MF .\osgi-sample-equinox.jar -C .\bin\ . 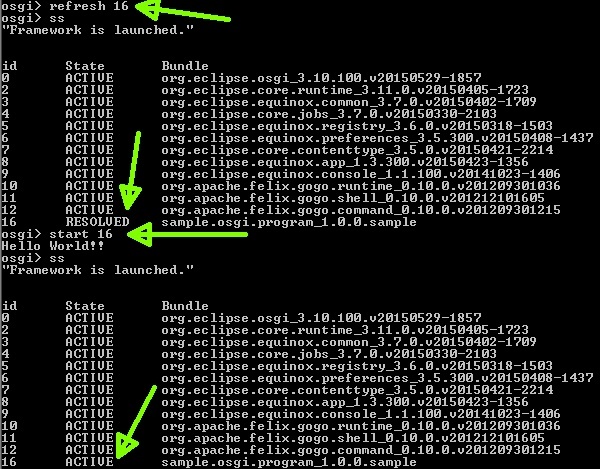 On my machine the created bundle osgi-sample-felix.jar resides in the folder osgi\sample and again on my machine I have started Apache Felix from the folder osgi\felix-framework-5.0.1. On my machine the created bundle osgi-sample-equinox.jar resides in the folder osgi\sample and again on my machine I have started Eclipse Equinox from the folder osgi\equinox-SDK-Mars. This time the console output is much wider, so I'm going to use screenshots. First we want to see what's the current status of all bundles. We use the ss command. Next we want to install our bundle. We use the install command. When we ss again, we see that our bundle has been installed. In order to resolve the dependencise, we can use the refresh command. Or we can directly use the start command which will automatically try to resolve the dependencies. The same could have been done in Apache Felix but here we do the steps one by one in order to see the full picture. After we have resolved the dependencies we use the start command in order to activate our OSGi bundle. We use the stop command when we want to deactivate OSGi bundle. 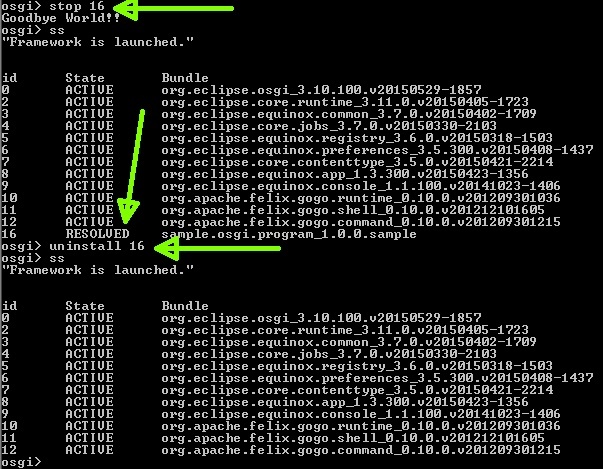 And we use the uninstall command in order to remove OSGi bundle. By the way, you can install the Felix bundle in Equinox and vice versa. You can try it. 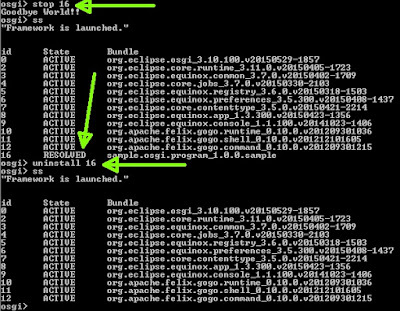 However, you can't install both bundles in the same OSGi environment. That's because both bundles have the same symbolic name and the same version. you save my life ! This is also a clear explanation.. Thank you again... If you have any experience about OSGI tools, a blog post related to suggestion of OSGI tools will be very useful for us.